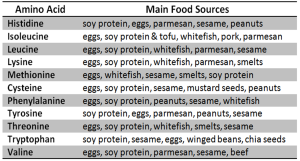 Amino acids are obtained from proteins available from different foods. The amino acids form the muscle tissue and improves fat metabolism. Mostly all the athletes and body builders intake amino acids for maintaining their body. It is not only for athletes and body builders but each and every individual has to take the required amount of protein as per the body needs daily. The amino acids not only assists in body building but also aids in metabolism, cell development and respiration etc. The essential amino acids cannot be produced by the body . These amino acids should be possessed by consuming food rich in protein. The non essential amino acids are produced inside the body in combination with two or more amino acids. Sufficient intake of protein as per RDA is required to form all the 22 Amino acids. The lesser intake of protein effects the bodily functions, the non essential amino acids also cannot be produced by the body in such a condition. The role of proteins in maintaing a healthy life is significant. The deficiency of certain amino acids effects the metabolism and can lead to severe health problems. Studies have proven that proteins from plant sources tend to have low concentration of protein in mass when compared to meat , eggs and dairy products.